While researching MySite Permissions I found the following table online that I think will be nice to Blog for future reference. 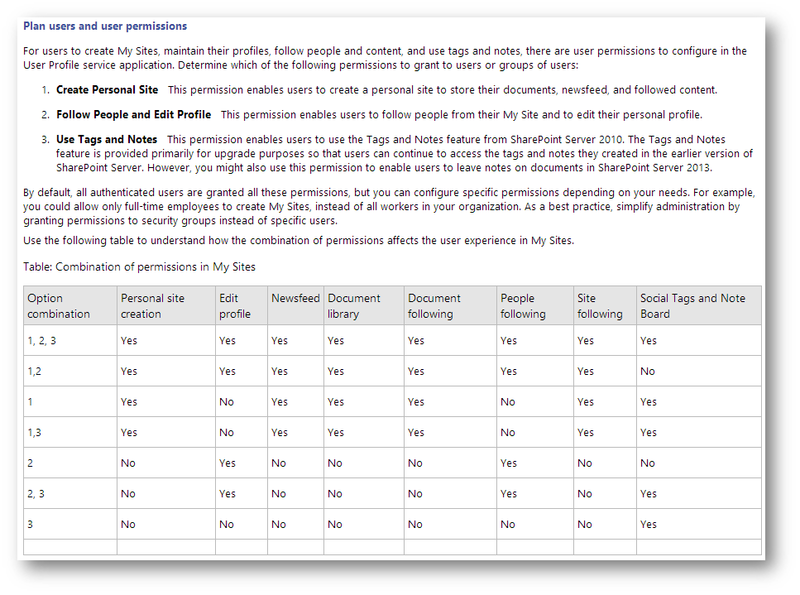 The table describes how the combination of User Profile Service permissions influence the Users experience in the MySite. User licenceenforcement zorgt ervoor dat er licentie "usage data" wordt gelogd, en toegang tot mogelijkheden die niet binnen de geconfigureerde licentievorm vallen wordt geblokkeerd. Deze functionaliteit staat standaard uit bij installatie van SP2013 en moet expliciet worden aangezet. ULE mogelijkheden werken alleen met een Claims Based omgeving.Om ULE toe te passen kunnen er Active Directory Security Groups worden aangemaakt waaraan vervolgens een licentie categorie wordt gekoppeld. Een licentie categorie kan ook aan een formsbasedrole of een claim worden gekoppeld. Er kan aan verschillende Security Groups in het AD, waar in totaal alle gebruikers van een bedrijf in aanwezig zijn, een licentie categorie gekoppeld worden. Door de licentie catagorie“Standard” aan deze security groups te hangen, krijgen alle gebruikers alleen toegang tot de functionaliteiten die vallen onder de Standard CAL van SharePoint. Voor Office Web Apps moet de categorie “WAC” aan dezelfde groep worden toegekend. Naast het afdwingen van Webpartsworden ook in de Webpart Gallery mogelijkheden weggenomen als dit onder de geconfigureerde licentie voor de gebruiker noodzakelijk is. Als de gebruiker een Standard CAL heeft, dan zullen de Enterprise CAL webparts ook niet getoond worden, en is het niet mogelijk voor de gebruiker ze toe te voegen aan een pagina. Logging loopt via de Usage and Health data collection in Central Admin. Iedere keers als de gebruiker toegang tot SharePoint vraagt wordt dit gelogd in de Usage Data. SharePoint houd een cache bij (in de Distributed Cache) om tijdelijk logging data in op te slaan, voor het geval dezelfde gebruiker nogmaals toegang vraagt tot SharePoint. Hiermee wordt voorkomen dat de logs vollopen met toegangsmeldingen van dezelfde gebruiker. De cache wordt 24 uur vastgehouden waarna hij wordt opgeschoond, en dezelfde gebruiker opnieuw gelogd zal worden. Note: Whether user license enforcement is enabled or not, usage data is logged about which features a user accesses and which licenses they have. Note: If user license enforcement is disabled, then the log entries are simply mapped to the installed SKUs which are standard or enterprise. So, a user accessing a SharePoint deployment that has the Enterprise CAL will be logged as an Enterprise CAL user. If a user accesses a SharePoint deployment with the Standard CAL, then log entries will contain the Standard CAL for that user. Only standard and enterprise are logged in this case. Note: If user license enforcement is enabled, then access to unlicensed features will be logged as ‘unlicensed’. If a user belongs to more than 1 CAL group, a seperate log entry will be added for each CAL pertaining to the user. As well, user CAL and device CAL information will be included so that a user’s name that is attempting to access the feature, along with their IP address. NOTE: User License Enforcement can be used to compliment blended CAL scenarios (such as serving Enterprise and Standard CALs within a single-server farm), but does not enable compliance. In addition the MAP toolkit can be implemented for reporting purposes. Creates a Office365 Preview environment today using a VM running windows 8 and office 2013 (just for the fun of it). Next blogpost I will be wrting from Word 2013, lets hope it works. Got this error after creating some taxonomy fields and then importing them into Visual Studio using CKSDev. If I then tried to connect a term to the taxonomy field the error occured. This did not happen at first, but only after removing my Development Site Collection, and then deploying again from Visual Studio to a new clean sitecollection. because first statement would fail if checked-out by someone else. This post will descibe what you need, and what to watch out for when you are planning to add webparts to a publishing page using powershell. Scroll down and skip the plumbing part for the good bits. First of all: get PowerGUI (or PowerGui for visual studio using the extension gallery) this will make your life a whole lot easier. Lets start with the information we have and create a batchfile. This is not required, but makes life a lot easier when you want to execute your powershell script multiple times, or have to deal with a Sys-Op that does not know any powershell. The case: we would like to add webparts to multiple zones on publishing pages of a portal. In the webpart gallery we have a custom webpart (CQWP) with the title: "Related Documents"
This webpart needs to be added to the webpartzone with zoneid called "zone1" in all pages that have a certain pagelayout. We create a batchfile and set all the parameters we need. PS: The script is capable of putting multiple webparts into a single zone. Now we can start on the AddWebParts.ps1 file. Set the pagelayoutfilenames we want to add the webparts to, and we know the zoneid exists on. This is required because the (very)LimitedWebpartManager does not allow us to check if a webpartzone exists in a page! If the zone does not exist, SharePoint will just put the webpart in the first zone it can find. With all the plumbing done we can start on actually doing something. # Create a new instance of the site. Write-Host "Web is not a publishing web, skipping"
Write-Host "Page is of valid layout, processing page (" $page.Name ")"
Write-Host "Page is of invalid layout (" $pubPage.Layout.Name "). Skipping." Write-Host "starting page processing -----"
Get WebPartFromGallery reads a webparts XML definition. It reads the definition from the webpartgallery and finds the webpart based on the webpart name. Write-Host "Getting " $webPartName " from gallery." Write-Host "Webpart found in gallery"
The next two functions do all the heavy lifting in this script (the good stuff). The first function allows us to rerun the script multiple times. This is allows us to make changed to a webpart, upload it to the gallery and replace the existing webparts with new ones on all pages. It searched the page for a webpart with a certain title. if the webpart is found on the page, the webpart will be removed. After that the second (add) function will be called. The second function adds the webpart that was read from the gallery onto the page into the specific zone. Both functions contain a section (needs refactoring :) ) thats sets the HTTPContext. This is the part of the functions that is very interesting, and basically the reason for writing this blogpost. This code was added, because when we are instantiating webparts that contain URL's (like the CQWP contains an XslItemLink, XslMainLink or XslHeaderLink ) The properties of the webpart class are used to set the values in the webpart object. These URL properties internally call makeserverrelative and that uses the HTTP context. However, because we are running inside of powershell, these is no HttpContext. This problem does not occur with the standard SharePoint webparts I tested, because the XML definition of these webparts does not contain any URL properties. But when trying to put the customised CQWP (related documents) on the page, I got an error. After a lot of debugging manually creating a HTTPContext was the solution because of the reason stated above. I hope this information will save someone a lot of time. $req = New-Object System.Web.HttpRequest "", $web.Url, ""
I always start a Transcript before executing the script. Let say we have a publishing page, and we create a link on that publishing page to the NewForm of a List. Aftre the user created the listitem we would like to go back to the page the user clicked the link, in stead of the list overview page. When you want to return to the page you came from, sharepoint uses a QueryString Parameter called "source". So you will have to manually add the source parameter for that link. Found out today that the behaviour of the PublishingWebControls:EditModePanel changed between MOSS2007 and SP2010. Apparently,now in SP2010, you need the EditItem Permission to be able to see what is in an EditModePanel even if the PageDisplayMode attribute is set to "Display". I keep losing this really handy xsl for displaying the raw search result XML in SharePoint. Blogging it for future reference :). When you upgrade to Microsoft SharePoint Server 2010, some of the new SharePoint Enterprise Search Web Parts are missing from the Web Part gallery for upgraded site collections. This topic describes how you can add these Web Parts to the Web Part galleries of the upgraded site collections. Today I waisted some time installing Windows 7 on my new Lenovo W510. It has 2 HDD's so I could not use a win7 DVD. No problem there. Borrowed a USB stick from a collegue (Thnx Jan) and downloaded this little tool. 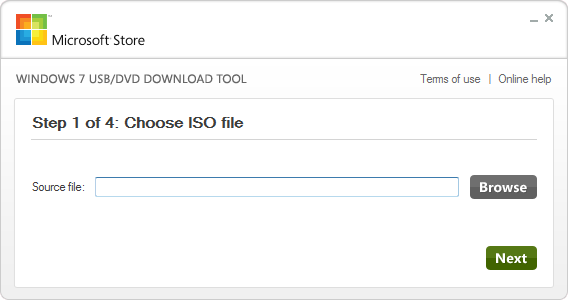 This allows you to copy an ISO of Windows7 to a USB drive and install it from there. After copying the windows7 files to the USB drive I was ready to get started. So I put the drive in the side USB ports of the W510 and gor started. 30 minutes and lots of error messages later I decided to BING it. It turns out you cannot install the laptop with a external USB drive (or USB dvd player) on any but the rear usb. I guess that this port is on another controller that is supported by default and the side (USB 3.0) ports are on another controller that is not. The issue occurs on a publishing site that has a contenttype containing a Publishing Hyperlink (SPFieldLink). Inserting a link with the Link Tools Tab of the ribbon works fine, but removing the link after it has been set does not. Now open the page again. In our situation, the message 'Click here...' is gone, and if you view the source our original link is still there, but there is no text inside it. It happens on Dutch and English sites. Basicly it states that the bug can be reproduced consistently and it has been reported to the product team. Lets hope this will be fixed in the next CU. About a week ago Microsoft published the XML Schema Definition (XSD) files for the Microsoft Visio 2010 XML Drawing (.vdx) format. This schema is also known as DatadiagramML. This should make it alot easier to use the visio file to generate code based in the visio file. More information about the schema is available in the Visio 2010 XML Schema Reference on MSDN.